We came across SSgt. 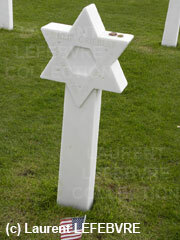 Griebler's grave on a visit to the beautiful cemetery on Omaha Beach. We paused at his Star of David and said a prayer. Thank you, Philip Griebler, for defending our country at the cost of your life. May you rest in peace, gallant soldier.